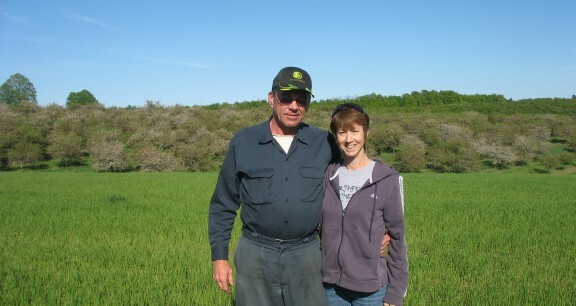 It wasn’t easy to arrange a meeting with farmers Mike and Jeanette Egeler. Both work seven days a week, most days well into the evening. Between their cherry farm, Mike’s excavating/snowplowing/firewood business and Jeanette’s exercise studio in Northport they’re pretty darn busy. Mike worked under the tutelage of his dad, who passed away in 1991, and his uncle, Marvin Egeler, who still lives on the farm and was part owner of the land until just recently. He is optimistic about the future of the farm—and about the cherry industry as a whole. That’s one reason that he and Jeanette decided to forever preserve their land through a sale of development rights. (see box.) The Conservancy was able to obtain a $1.1 million grant from the U.S. Department of Agriculture Farm and Ranchland Protection Program (FRPP) in 2012 to help protect the Egeler farm as well as two others (the Kelenske and Esch farms). These three farms total 383 acres, adding to our growing total of over 4,000 acres of permanently protected family owned farms. This spring, all the paperwork was in order so that the Egelers could receive their FRPP funds—the end to a process they began thinking about in 2011. “Some of our motivation was to help the farm to get back into the black and to buy out my uncle,” says Mike. “Working with the Conservancy has given me the chance to farm the land in the way it’s supposed to be farmed and to take a little of the worry away.” Jeanette laughs and says that the Mike’s frown lines on his forehead have not gone away entirely, but they have certainly faded some. He’s also been able to purchase some needed equipment, such as a wider mower that covers double the ground half the time. He replaced an ancient tractor/sprayer with one that has an air conditioned cab, which means he no longer has to drive with the door open, inhaling pesticides. A brush chopper, which grinds old trees into mulch, was also purchased. “We are practicing good conservation, by putting the carbon back into the soil instead burning the trees,” says Mike. The farm off Eagle Highway adds to a substantial block of protected farmland in the East Leland-Suttons Bay Fruit Belt area. It is contiguous to two other protected farms—45 North Winery and Steve & Pam Bardenhagen’s farm, where those much loved strawberries and more are grown. The Egelers, who live in Northport, have two grown children as well as three grandchildren. Son Jacob has a job in the tech world, but his heart, says Jeanette, is still on the farm where he toiled throughout high school and college summers. Maybe he’ll take over one day, she says. The Conservancy works with willing farmers and landowners who wish to permanently preserve their lands. The program can be a great tool to help the older generation prepare for retirement and enable the next generation to take over the farm. One of the key barriers to young farmers is the cost of land. Too often, farmable acreage is too expensive to cash-flow a crop due to the desirability for second-home development. The FRPP program helps resolve this issue by paying the owner to remove the “development premium” on the land, making the acreage more affordable. Although the right to future residential development is eliminated, the family continues to own the land and to have the right to farm it. The property also remains on the tax rolls. At the community-level, it helps keep the agricultural economy and the business environment for farming strong by protecting larger blocks of intact farms. FRPP awards cover half the cost of protecting family farms. The Leelanau Conservancy must raise 25% of the needed funding and each farm family also must donate 25 percent of the appraised value necessary to complete the projects.